It's headlines like these that you live for sometimes. Snugbury's Famous Ice Cream, a farm and dairy based in the West Midlands, has been crafting giant straw sculptures to sit alongside its site on the Chester Road for over a decade - and they've done everything from Big Ben to the Lovell Telescope. 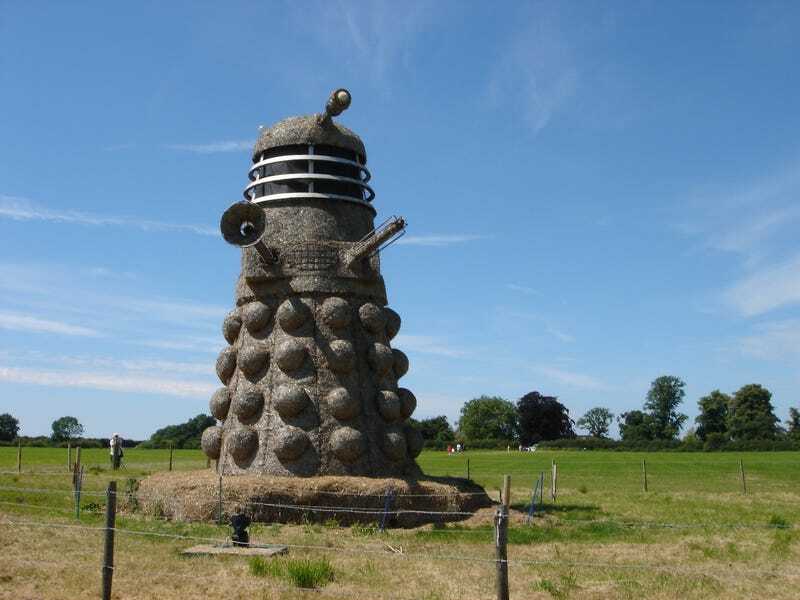 This year's undertaking is a bit more extreme though, with 700 hours of work required to work 5 tons of steel wireframes and another 6 tons of straw into the shape of a mahoosive Dalek. It even has moving parts and speaks! The decision to make a Dalek for the annual sculpture was spurred by public celebrations to celebrate the show's 50th Anniversary last year. Snugbury's also sold a special 'Dalick' Ice Cream over the summer to raise £3000 for Cancer Research UK. It's not the first time there's been Doctor Who related shenanigans in a field lately - last year the York Maze literally carved Matt Smith's face into a field.